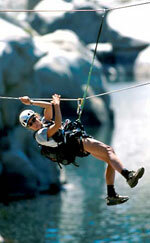 So you’re an adrenaline junkie, with a thirst for a holiday in the active/adventure holiday category? Here are a few tips that are worth considering before you book your holiday. Before you settle on a holiday destination – regardless of whether you’re traveling independently or with a company – check Visa and inoculation requirements with the Foreign Office (www.fco.gov.uk) and that the country you’re traveling to is both safe and politically stable. You may not be insured if you go against Foreign Office advice. Its good new that there are a great number of companies that offer insurance specially formulated toward groups or independent adventurers, who aren’t satisfied with relaxing on a secluded beach like the rest of us. Each company has varying opinions about what is and isn’t classed as adventure, so it’s worth taking some time to find a policy that suits your style of adventure and chosen activity. When booking your adventure holiday, do your research into the company that you are booking with and ask a representative about the experience and qualifications of their staff, as your life may just be in their hands. Check that the equipment that you will be using throughout the trip is certified safe and has been tested for any faults. If you decide against going as a group or with a reputable adventure holiday operator, there is a checklist that should be considered. Firstly that you are aware of the dangers of the type of sport you will be partaking in and that you have made sure your equipment is thoroughly checked before packing it to leave. Another important thing to remember is to always have local emergency numbers and insurance documentation with you and that someone knows where you are heading each day encase an accident does happen. Also if a minor accident does happen you have a first aid kit to deal with it. It is worth making sure you are ready to put your body under the strain that your chosen activity will put on it. If you are a newcomer to the sport, try doing a training session at a local facility in order to get a feel for the muscles that will be needed. This may also alert you to additional safety clothing /equipment you might require on your trip. Whether you’re experienced or not spending some time preparing your body will help minimize injury during your trip. As you can see an adventure holiday takes lots more planning than your standard package beach holiday, but it’s better to prepared and get the most from your adventure, so you can do it all again on your next adventure. I’d have to concede with you on this. Which is not something I usually do! I love reading a post that will make people think. Also, thanks for allowing me to speak my mind!